This was lunch for my 8 year old nephew on a day that we were out and about. It was packed in an insulated bag with an ice pack. I thought that the pretzel sticks would get soft but he said that they were alright. Target: I mixed the colors with hot rice and packed into the circle cookie cutters then I carefully lifted out the metal rings. I started with the outer rings and worked inward. It was actually easier to make than I expected. 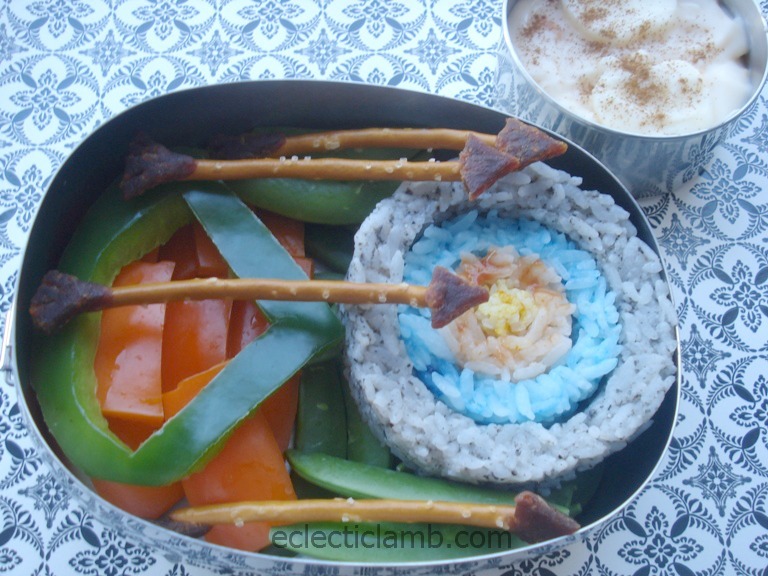 This entry was posted in Bento / Cute Food and tagged bento, bow and arrows lunch, vegetarian. Bookmark the permalink. This bento is so cool!!! The design elements are very strong – it could be a sculpture! I am sure our nephew was impressed. Thank you so much! I think that he was impressed. He ate the whole thing. I was not thrilled with the photo, lighting was not right and I was in a hurry to get out the door. But I was pleased that the rings worked the way I had imagined. oh I love the way you made the target! So pretty! Its really an artistic bento! Your nephew is so fortunate to have you preparing all the lunches. Very cute – I love this!